Our first winter in Portland was wet. We moved here in 2015 with Jenny’s sister and her husband, who is also my business partner (I learned in business school that working with family can never go wrong). I’ll refer to them as The Smith’s to protect their identities. The Smith’s purchased a newly remodeled home in the SE and their finished basement flooded the first time it rained. The contractor who’d remodeled the home took responsibility and stepped in to fix it. The water damage was extensive. They had to remove the carpet, cut the first two feet of wallboard out to expose the studs and bust tile out of the bathroom. They put it back together just like new. They resolved the problem that caused the flooding which turned out to be a water service line that was abandoned during the remodel but not appropriately capped. At least that’s what they thought until it rained again two weeks later. The Smith’s sent us a picture of a little waterfall that was coming through a window well and pouring into their re-remodeled basement. After removing the walls, floor, and tile again, and planning for the re-re-remodel, they called a waterproofing specialist. My business partner explained the proposed solution. It didn’t waterproof anything. Instead, it encouraged water to flood into the basement. Professionally, my job is to think about hard problems in novel ways and find better solutions. In this capacity, I learned when a solution seems wrong, it usually is. However, if a solution looks like an outrageously bad idea and it pisses me off to even hear about it… that’s realm where innovation resides. Solving the basement flooding problem by embracing the flood seemed like one of these magical solutions. I went to see the waterproofing company install the system for the Smith’s. When I arrived, they were sawing the concrete floor down the middle of the basement. It was a mess in there. They’d already dug a hole and installed a sump below the basement floor at one end of the house. They cut out a 6" strip of concrete along the walls of the basement and down the middle. After cutting out the floor, they dug down another foot and installed drainage pipe that would guide water in that trench into the sump. After the drainage pipe was installed and plumbed to the sump, they repaired the cuts they'd made in the floor with new concrete. When everything was sealed, they left a seam open where the basement floor met the walls so water could enter this channel. Then they installed a dimpled water barrier material on the walls and tucked it into this seam. It looked like heavy-duty bubble-wrap. Water that made its way into the basement would flow between the interior wall and the bubble-wrap barrier, and be guided into the seam in the floor before touching any of the finished interior. From there, it would follow the drainage pipe and flow into the sump. The installer drilled through the foundation under each window and installed a pipe so water that ended up in the window wells would come inside the basement before it reached the window. Inside the sump, they installed a pump that was triggered by rising water. The pump ejected water accumulating in the sump which was sent back outside. To make the system more resilient, a second pump was added on a different electrical circuit so water would still get sent back outside if a breaker tripped. A third pump that was added, attached to a battery to keep water moving during power outages. By not fixing the problem, but rather making the problem not a problem, they fixed the problem. I envied the Smith’s brazen carefree attitude towards above average precipitation and wanted to have this in my life. In fact, I don’t mind telling you I have a bit of a water fetish. Especially when pumps are involved. As proof of my personal passion for water and pumps, I offer this unrelated bit about the time my well water was toxic so I MacGyver’d my own water treatment system. When we started tearing up the Going Queen basement, I thought about all the lovely things we were going to do in the space and how sad we’d be if it got flooded. I decided we too would invite water into our basement and avoid this sadness. 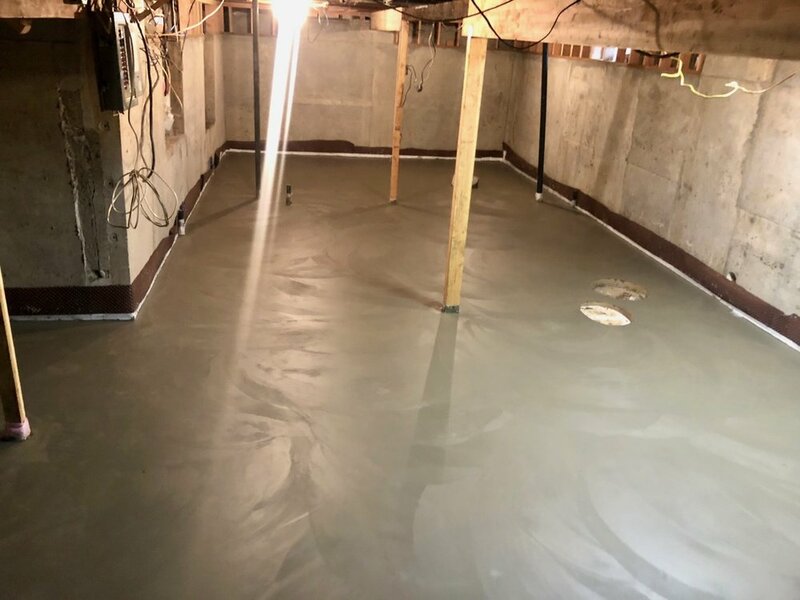 Before we poured the basement floor, we had John’s Waterproofing come out and install such a system. The concrete crew from Jaff Inc. prepared the floor by compacting rock and leveling it with sand. The team from John’s installed drainage channels against the walls. The channels are taped together temporarily. The concrete will hold it together once the floor is poured. Every wall has an access port with a screw top. 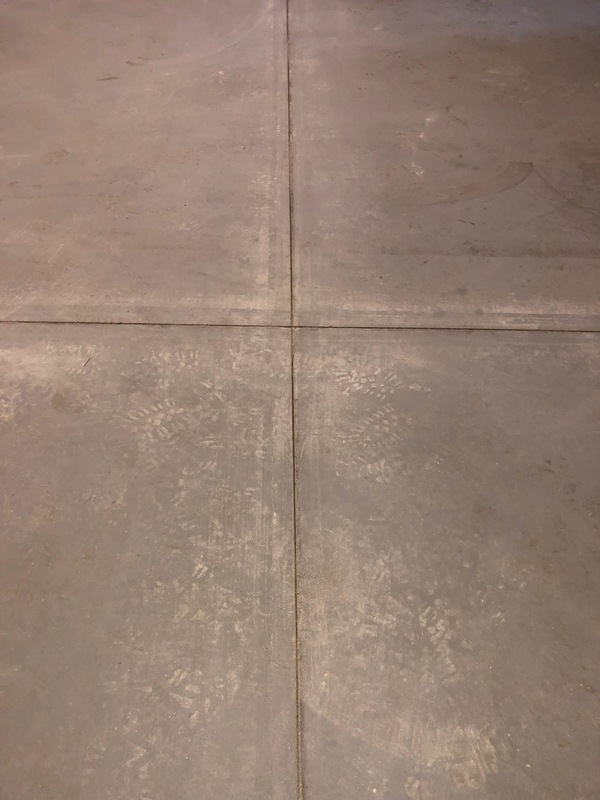 The floor is poured just to the top of these access ports. These can be used for cleaning out the drainage channels. When the finished walls are added later, our contractor will create removable trim pieces that will give access to these ports. The dimpled material is tucked into the drainage channel. Once the floor is poured, John’s Waterproofing will come back and install the dimpled water barrier all the way up the wall. 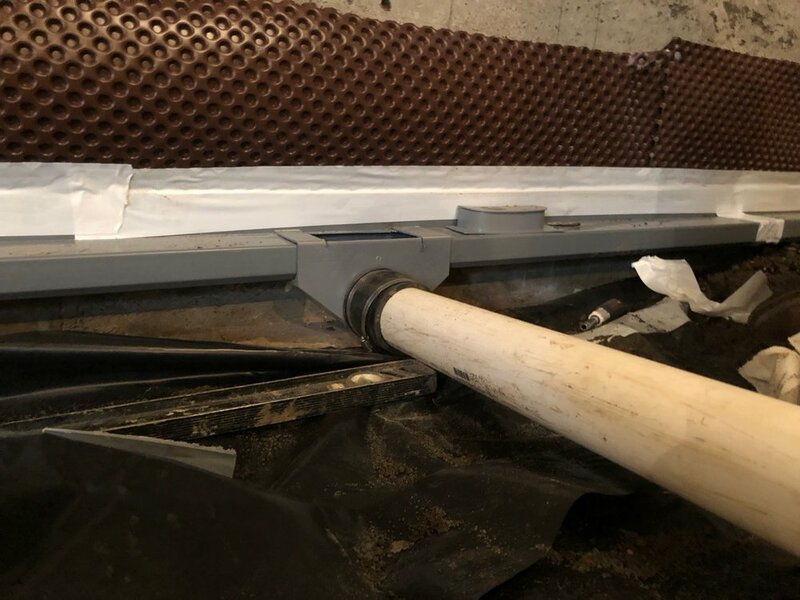 A spacer is placed under each window well to create an opening to fit a drain line that will be installed through the concrete wall under all window openings. During a heavy rain, if the window wells start filling with water, instead of the water rising up to the exterior window trim where it might find it’s way into the basement or damage the exterior, the water will pour into the basement and end up in the drainage channels built into the floor. A larger fitting is attached at the lowest point of the drainage channel where it connects to a 2” pipe. Water will then empty into the sump where the “Triple Safe” pump system is waiting to eject the water. After the John’s crew finished laying the drainage channels, the Jaff concrete crew ties the rebar reinforcement in the floor and preps for pumping concrete. 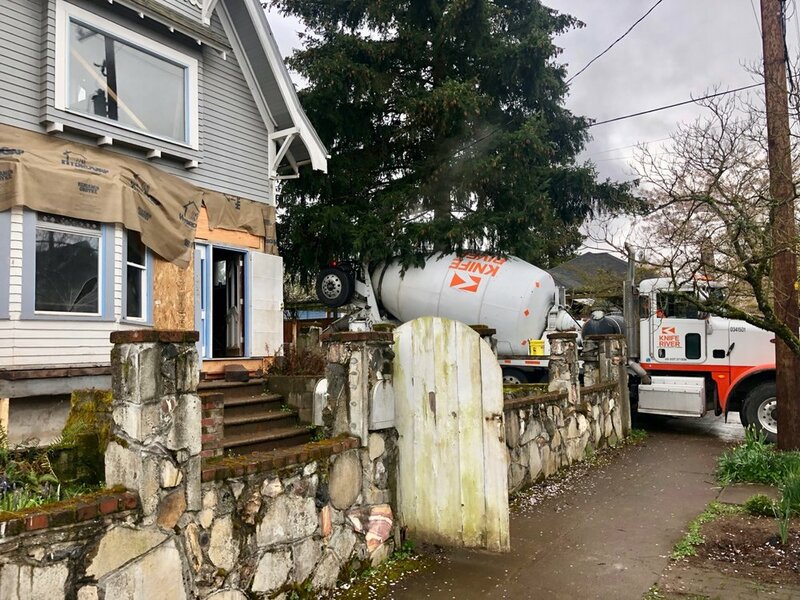 The first of two trucks backs into the alley next to the house loaded with 28,000 pounds of concrete. A concrete pump is waiting there to send it into the basement. One of the future window wells is used to send in the concrete. A hose runs through the window opening. The Jaff crew uses the hose to fill the basement with concrete to about 6” deep. They use two-by-fours to level the floor and apply a rough finish. The sumps are protected by cardboard tubes which will be removed later with the sump trim is installed in the floor. From the image below, you can see there are two sumps. Not to confuse y’all but one is connected to the system John’s put in and the other one connects to the john. Why do we have a second sump connected to the john? It’s because the sewer line is higher than the basement floor and we need to lift poop up there so it can make it into the Columbia River. I’ll explain that later. Not about poop. UMass has a great white paper on poop if you want to know what that is. I’ll explain why we have to macerate ours into danger smoothies and eject it like the flood waters John’s Waterproofing is helping us prepare for. After letting the concrete set for about an hour, the Jaff crew trowels a smooth finish on the concrete floor before it hardens all the way. This is important to us because we are super-hip and fashionable and therefore keeping the raw concrete floor as final finished flooring. Concrete always cracks. Small cracks are hip but having large cracks running the length of the basement isn’t as stylish so it’s best to control them. One way to try to contain cracking is to make shallow saw cuts. If the cracks are surface only, they’ll hit these intentional cuts and terminate. Finishing the floor in the basement feels like a milestone. So I’m calling it “Done”. By done, I mean it’s not really done at all, but it feels like something big happened.